I got into LEGO at a early age - it was one of the first distinct toy brands that I remember getting into when I was about 3 years old. And while I don't collect them as much as I used to these days (primarily because of cost and difficulty of storage), I maintain a love for the franchise and I still get into the various LEGO-themed games that are released for various console platforms. At first I was worried that The Lego Movie would just be a horribly long commercial for the toyline. And I know that's a somewhat funny statement to hear from someone who is so into the Transformers franchise - one that grew to great success because of a cartoon series that was also pretty much a series of commercials disguised as stories. But as the trailers for the movie started to hit the internet and more and more information was released about what the film would actually be about, it was clear that they had decided to make a heck of a lot more of this movie than I had anticipated. And the end result was actually pretty awesome. 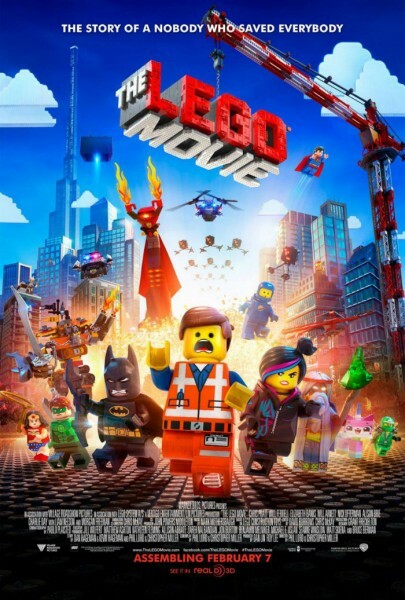 Synopsis: The Lego Movie is a 2014 CGI-animated comedy movie directed and co-written by Phil Lord and Chris Miller of Cloudy With a Chance of Meatballs fame. The film is strongly inspired by the various LEGO construction sets released over the years. The wizard Vitruvius (Morgan Freeman) does his best to guard a secret weapon known only as the "Kragle" but in the end Lord Business (Will Ferrell) and his robot minions manage to steal the item away. Vitruvius is blinded during the confrontation and reveals the secret of a prophecy about a "Special" master builder who will find the Piece of Resistance - the only object that can defeat the Kragle. Over eight years later we are introduced to Emmet (Chris Pratt), an extremely ordinary guy who works in construction during the day. He does his best to live his life according to the instructions provided to everyone by the Octan Corporation - the very company run by President Business. After another regular day, he has a chance encounter with Wyldstyle (Elizabeth Banks) that somehow leads to him accidentally discovering the fabled Piece of Resistance. Based on the prophecy, that would make Emmet the Special - if only he could come up with any original ideas of his own to justify the title. First, let's talk about the quality of the animation - it's as a good a place to start as any. I have to admit that at first I was debating with myself whether or not parts of this movie was the result of stop-motion animation. There's just something about the jerkiness of the motion of some of the characters and the way some of the action sequences are presented that had me thinking this. But it's really all just beautifully rendered CGI with a conscious effort to remain consistent with actual LEGO physics as much as possible. Thus you the characters still don't have actual knees to speak off and their hair can't even blow in the wind or anything like that. Just look at any scene involving water - the fact that it's rendered as a series of smaller and smaller LEGO pieces makes for some really amazing motion. And the decision to animate things in this manner all really ties into how this movie is designed to be a major nostalgia flick, something like Wreck-It Ralph. That movie was fun since it featured a number of notable characters as cameos and generally celebrated the gaming genre as a whole. The Lego Movie is different given it's firmly entrenched in its own nostalgia - it's a movie that's more about a play experience than specific characters. And while there have been interesting franchise crossovers with LEGO like Star Wars and Harry Potter (that all get featured in the movie), LEGO is more about the individual memories we have with these bricks. And thus the movie, like the toys themselves, tries to touch on a wide variety of LEGO playset themes that we've seen over the years. As we travel trough the different LEGO universes, we're pretty much re-living the various toys of the past. And the attention to detail is phenomenal like how master builders are able to see LEGO pieces based on their classification codes or the fact that Benny (Charlie Day) the spaceman's helmet is broken right in the middle, as happened to many such spacemen minifigs from the 80's. The story is a little weird, but everything starts to come together in time. And when all the major components of the story are fully in play, everything just becomes one wild ride. It's a fun adventure that had me laughing all throughout the movie and one with a bit of a twist ending that still made sense. The Lego Movie is fun, plain and simple. Some younger kids with less exposure to the playsets may not have quite as much fun with the movie, but I'm sure the rest of us will enjoy watching this movie over and over again. So I'm going to rate this movie as 5 crazily original LEGO creations out of a possible 5 - because everything is awesome!